From the beginning, it's been part of City Tours Europe's company philosophy to give young people from all around Europe an opportunity to get some professional experience while still in the middle of their formation, thanks to internship and traineeship programmes. Both parts get benefits out of this system: our interns get a chance to put their knowledge and skill to the test in the reality of a multisided company, to get a precious experience and to make contacts all over Europe. Our company enjoys the new points of view and ideas brought every year by each new generation of trainees - allowing City Tours Europe to remain on the cutting edge. We do also make a point of recruting our interns and trainees all around Europe so that our team becomes as multicultural as possible - which is a great advantage for everyone. Traineeship in redaction: City Tours Europe constantly has to produce a very large quantity of advertisment and press texts as well as articles about sights and leisures in the whole Europe for the advertising of our many and various services in the tourism and culture fields. We offer interested young people from all around Europe the opportunity to get professional experience in this field by thanks to an internship in text redaction and / or their illustration with carefully chosen, sometimes modified photos. This traineeship is now available in Vienna and in Innsbruck. Of course, the costs for research and photo documentation necessary to this work are of course payed by City Tours Europe. Internship in translation: most of our information and advertising texts have to be translated - not only in one language, but most of the time from one source language into at least three target languages. The kind of translation necessary varies a lot according to the kind of text and to the target readers: from a modest summary to the indisputable juridical translation of contracts. We offer to future translators the opportunity to get a feeling of the everyday internal and external communication in a multicultural and multinational tourism company and get professional experience and practical training while learning new translation strategies under the guidance of graduated translators and interpreters. As for now, we only offer internships in translation in Vienna. Nationality: EU citizenship, work permit or right of establishment. In other terms: City Tours Europe is not responsible for visas or authorisations. In case you are not an EU citizen, you must already have secured a work permit or a right of establishment before applying for an internship at City Tours. Language skills: at least one of the following languages at communication level (the more the best! ): German, French, Italian, Bulgarian, Austrian sign language. Any language mastered which does not appear on this list - apart from English - will increase our interest for the candidate! Application documents: a résumé with a photo and a letter of application are absolutely necessary. Additional photos, previous works (texts, pictures, websites, etc., according to the kind of internship) and any further information about yourself are more than welcome. If we find your candidature interesting, we will invite you to a personal interview either with one of our staff members in Vienna or with one of our representatives in some other place in Europe. We are looking forward to meeting you! 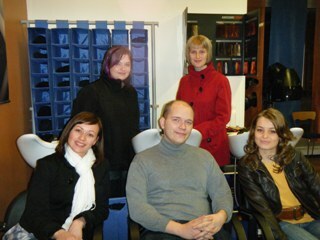 What's more: At City Tours Europe, the working atmosphere is rather informal and relaxed. We like spontaneous, creative, open-minded people. We have very few prejudices but we can be touchy. We are very nice to those who are nice to us... But we do not like to get insulted if we happen not to answer immediately - even if we do not answer at all!